2020 recruit Josh Lawrence leads the #9 nationally ranked Selects Academy 16Us in scoring with 83 points (27G, 56A) in 49 games. Charlie McAvoy assisted on the tying goal and then scored the overtime game-winner (video) in the Bruins’ 4-3 win against Carolina. The former BU All-American has seven goals and 30 points. McAvoy and Will Butcher are tied for second, by one point, among rookie blueliners in scoring. Former Terrier standout Danny O’Regan has been reunited with his Terrier linemates, Jack Eichel and Evan Rodrigues, after being traded to the Sabres by San Jose as part of a deal for Evander Kane. The 2017 AHL Rookie of the Year, had 25 points in 31 games for the San Jose Barracuda this year, along with four points in 19 games with the Sharks. Terriers season came to an end with a heartbreaking loss in game three of their quarterfinal series against Maine. BU took a 3-0 lead early in the third period only to see the Black Bears’s Stacey Brooke fashion a hat trick to tie the score. 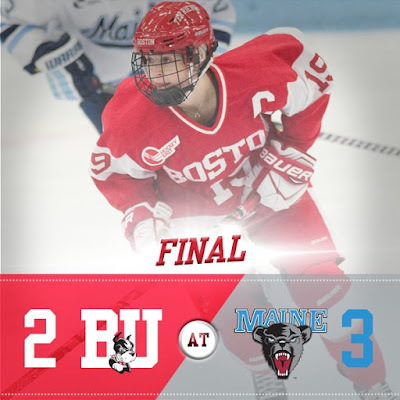 Maine’s Tereza Vanisova netted the game-winner at 4:39 of overtime. 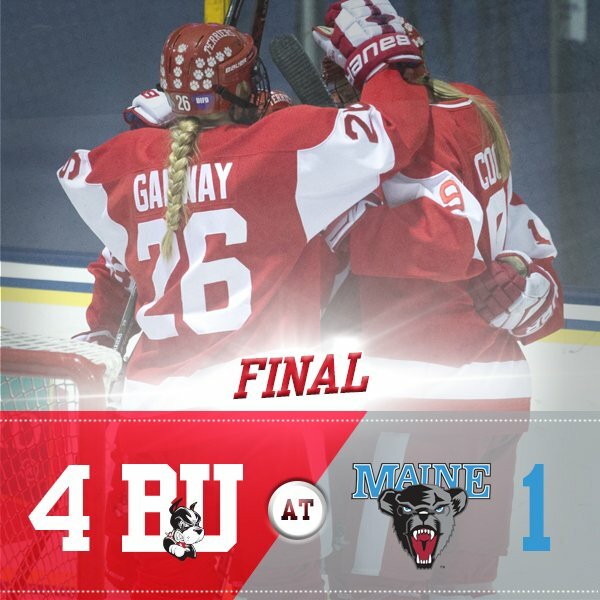 BU scored twice in the first period on power play goals by captain Rebecca Leslie and Victoria Bach. 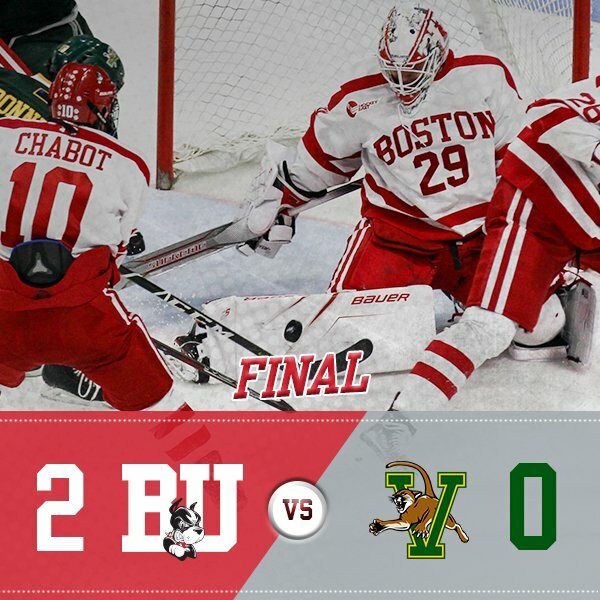 An unassisted tally by NataszaTarnowski gave BU its 3-0 lead. Goalie Erin O’Neil stopped 36 shots. Bach was named Hockey East Player of the Month for February, her third monthly honor of the season. 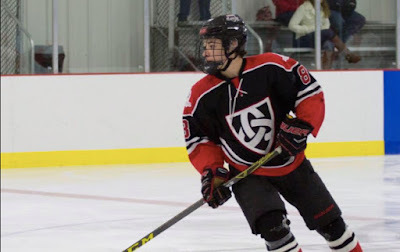 The senior led the league for the month with seven goals and 13 points and closed the month on a seven game point streak. 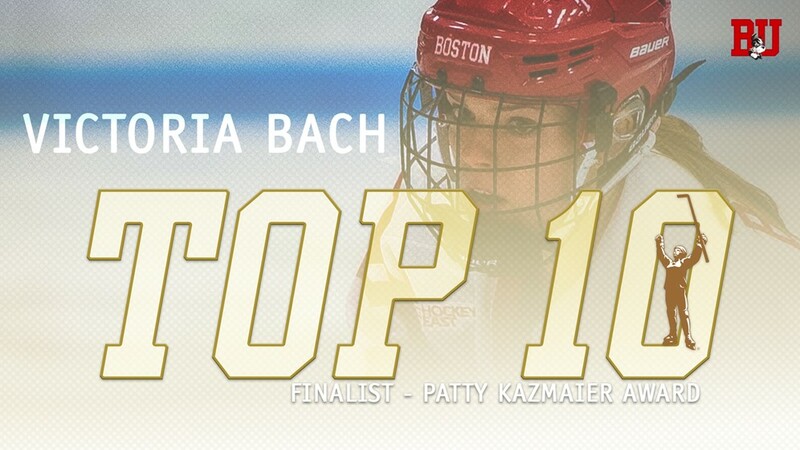 A finalist for the Patty Kazmaier Award, Bach finished her BU career as all-time leader in goals (104) and points (198). 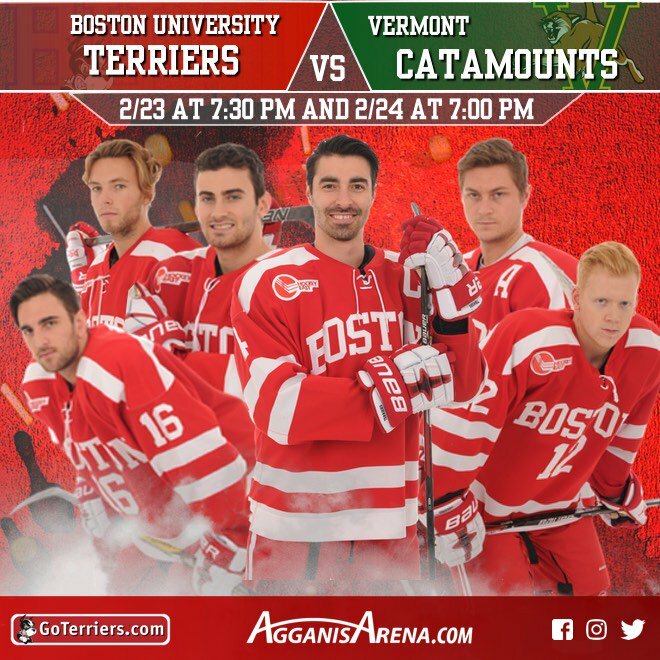 Terriers begin the final weekend of the regular season with a pair of home games against Vermont and an opportunity to clinch fourth place in Hockey East. Tonight’s contest at Agganis Arena starts at 7:30 p.m. ET. UConn’s loss to UMass last night guarantees BU either fourth or fifth seed and a bye in the first playoff round. 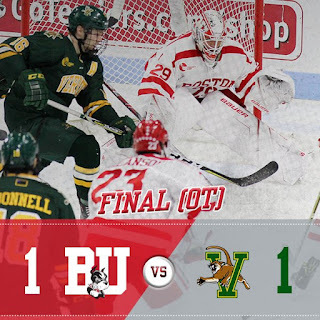 Terriers would secure fourth place by taking three points from the Catamounts. Any points Maine fails to get in its series with BC would reduce that number. all on their home ice. 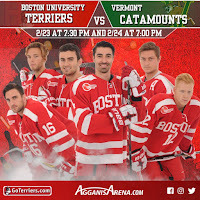 The Catamount attack is led by Colton Ross with 15 goals and 21 points and Alex Esposito with 19 points. One-time BU commit Liam Coughlin has 14 points. Sophomore goalie Stefnos Lekkas brings a 2.88 GAA and .912 save percentage to the game. It is expected that Jordan Greenway, who returned to Boston yesterday, will be in the Terrier line-up. Patrick Harper, who has not played since January 6, remains sidelined by illness. 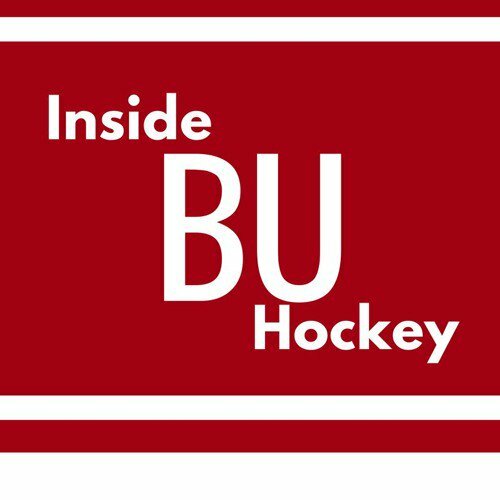 This week’s episode of Inside BU Hockey features Bernie Corbett’s interviews with Terrier Head Coach David Quinn and Vermont Head Coach Kevin Sneddon. Nick Bonino scored his ninth goal in the Predators' 7-1 rout of San Jose. Colin Wilson scored his sixth goal in the Avalanche's 3-2 overtime loss to Edmonton. Terriers begin a best-of-three quarterfinal playoff series against Maine at Alfond Arena. It marks the first time BU is playing a Hockey East playoff series on the road. 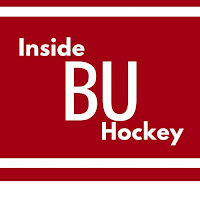 BU finished sixth in the conference while the Black Bears were third. Maine swept the season series, taking all three games. 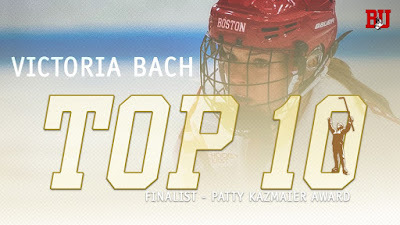 Senior Victoria Bach has been named a Top -10 finalist for the Patty Kazmaier Memorial Award, given annually to the top player in Women’s Division 1 hockey. 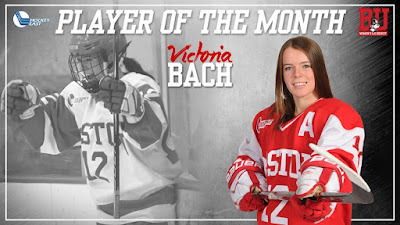 Bach is second in the nation in goals (36), first in goals per game (1.20) and third in points per game (2.03). She joins Marie-Philip Poulin and Sarah Lefort as Terriers nominated for the Kazmaier. Poulin and Jenn Wakefield of Team Canada earned silver medals at the PyeongChang Olympics after Team USA won the gold-medal game, 3-2, in a shootout. Poulin had given Canada a 2-1 lead before the U.S. tied the score in the third period. In the 2010 and 2014 gold-medal games (both against Team USA), Poulin scored the game-winning goals.